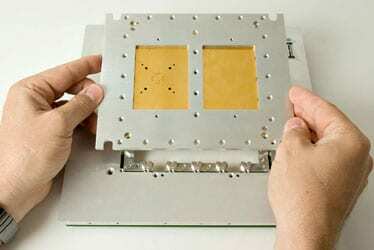 A modular test system is only as modular as it's least configurable component. 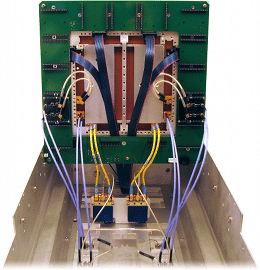 All of the functionality and capability of traditional load boards have been re-engineered to take advantage of the configurable instrument framework of Cassini. The discrete layers enable maximum design flexibility for high performance RF devices that can adapt to changing application needs. 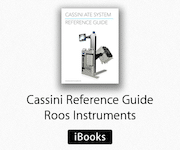 Fixtures carry the modular architecture of Cassini into the device interface environment. Housed in a rugged aluminum enclosure is a completely configurable test resource environment. 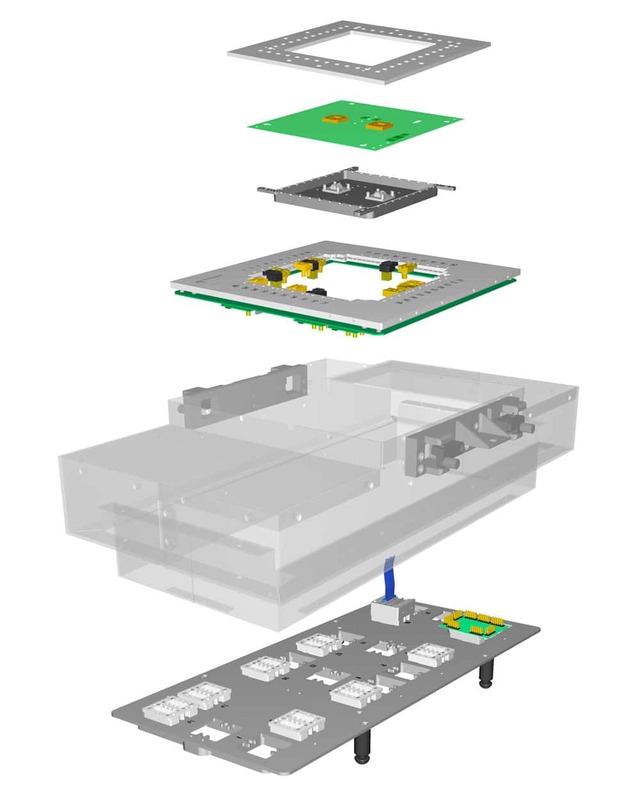 The form factor provides a versatile application range from DC to 90GHz and a rapid changeout system in production. Seamless integration with Cassini's software allow fixtures to extend and enhance the capabilities of test instruments with an integrated calibration layer that guarantees signal accuracy right to the device pin. Standardized interfaces, reusable components, and robust interconnects create a rapid development environment in which to design and iterate device applications. 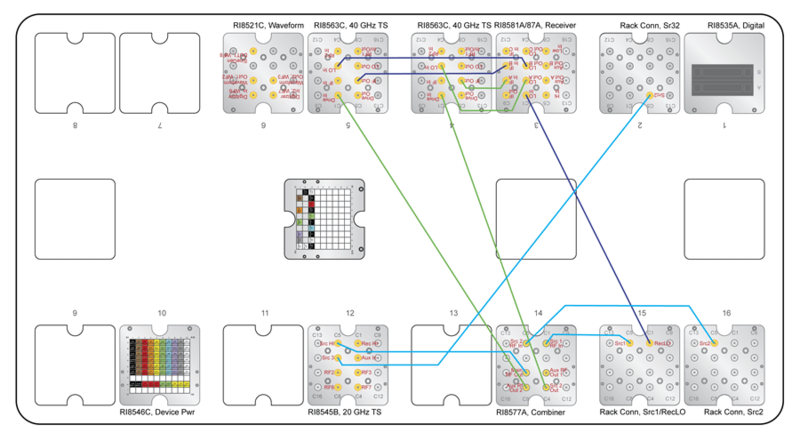 With easy access to all of the resources within the fixture, signal path switching and application-specific resources can be tailored to a device, a family of devices, or multiple test sites. Interchangeable DC, high-speed digital, and microwave inserts provide precise contact signal launches onto the device interface board.The inserts support a flexible signal topology for customizing to applications and creating symmetric multi-site layouts. The DIB, DIB clamp, and pedestal support comprise a single, serviceable unit in the fixture environment. Four quick-release screws allow for rapid change-out of the device interface layer in production. 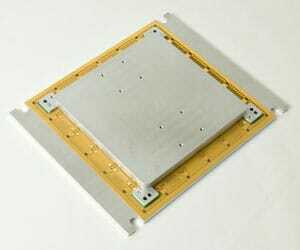 The precision-milled aluminum housing ensures accurate alignment of the PCB while guide pins align signal pads on the perimeter of the PCB with their corresponding signal launch inserts. The fixture bottom plate lets you customize Cassini to applications while allowing drop-in capability expansion quickly and cost-effectively. 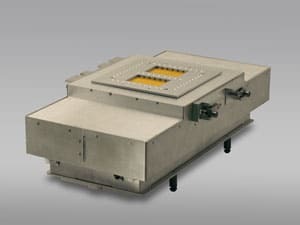 Blind-mate interface blocks and RF cables provide configurable interconnect between Test Instrument Modules to synthesize standard microwave instruments such as vector network analyzers, oscilloscopes, spectrum analyzers, frequency translation and receiver/transmitter chains.